MEYLE Parts Kit, automatic transmission oil change MEYLE-ORIGINAL Quality 300 135 1005. 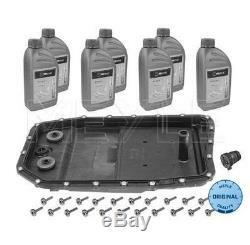 1x MEYLE Parts Kit, automatic transmission oil change MEYLE-ORIGINAL Quality 300 135 1005. 24 15 2 333 903. 2967 ccm, 175 KW, 238 PS. 2993 ccm, 180 KW, 245 PS. 5000 ccm, 405 KW, 550 PS. 2993 ccm, 150 KW, 204 PS. 3600 ccm, 200 KW, 272 PS. 4398 ccm, 245 KW, 333 PS. 2495 ccm, 147 KW, 200 PS. 4196 ccm, 219 KW, 298 PS. 2993 ccm, 160 KW, 218 PS. 3901 ccm, 190 KW, 258 PS. 5972 ccm, 327 KW, 445 PS. 3555 ccm, 190 KW, 258 PS. 4196 ccm, 291 KW, 395 PS. 2497 ccm, 130 KW, 177 PS. 2720 ccm, 152 KW, 207 PS. 4394 ccm, 220 KW, 299 PS. 2720 ccm, 140 KW, 190 PS. 2993 ccm, 200 KW, 272 PS. 4197 ccm, 291 KW, 396 PS. 4394 ccm, 225 KW, 306 PS. 2993 ccm, 170 KW, 231 PS. 4799 ccm, 270 KW, 367 PS. 4000 ccm, 225 KW, 306 PS. 4196 ccm, 291 KW, 396 PS. 4196 ccm, 306 KW, 416 PS. 2993 ccm, 210 KW, 286 PS. 2497 ccm, 120 KW, 163 PS. 2993 ccm, 145 KW, 197 PS. 2993 ccm, 173 KW, 235 PS. 3628 ccm, 200 KW, 272 PS. 3.6 TD 8 4x4. 4799 ccm, 261 KW, 355 PS. 4999 ccm, 276 KW, 375 PS. 4395 ccm, 300 KW, 408 PS. 2993 ccm, 202 KW, 275 PS. 5000 ccm, 283 KW, 385 PS. 5000 ccm, 375 KW, 510 PS. 4999 ccm, 375 KW, 510 PS. 2993 ccm, 225 KW, 306 PS. 3996 ccm, 209 KW, 284 PS. 2993 ccm, 155 KW, 211 PS. 5000 ccm, 390 KW, 530 PS. IMPORTANT NOTICE ABOUT PART FITMENT TO VEHICLE. If needed part is not yet listed, we can activate listing with needed part in case if we can provide it. We sell only new original (genuine) and aftermarket parts, therefore if you search for discontinued car parts from very old or very exotic cars, we will not help you. The item "MEYLE Parts Kit, automatic transmission oil change MEYLE-ORIGINAL Quality 300 13" is in sale since Saturday, January 6, 2018. This item is in the category "Auto & Motorrad\ Teile\Auto-Ersatz- & -Reparaturteile\Antriebsteile & Getriebe\Getriebe & Teile".eu" and is located in RIGA.